Delicate and enchanting designs for that feminine touch. I am loving shine-ink and am lucky enough to be friends with the owners. They are currently on show at Kamers vol geskenke in Irene Johannesburg and it’s going so well. They look striking and such fun. The gold and silver looks classy and is perfect for party dresses, on the beach against beautifully tanned skin. Love love it! These are gorgeous and perfect for the summer, it also removes easy! As someone who has tattoos, the idea of temporary tattoos has never really appealed to me. That is, until I saw the Shine Ink tattoos. Not only are the designs absolutely gorgeous, but the gold is so beautiful, making these the perfect accessory for festivals. The tattoo lasted roughly two days before it started to flake off, which is longer than I thought it would last. All in all, I think these tattoos are fun & I would definitely use them again. 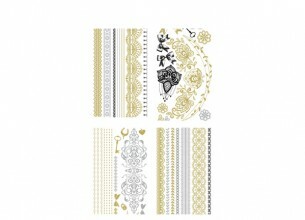 With all the designs available, you are bound to find one that you really love.